I studied Biochemistry and Zoology (BSc) at Rhodes University in the 80’s. After that, I did an Honours degree in Biochemistry (the subject fascinated me). After qualifying, I worked for many years in the Pharmaceutical industry including a stint in the South African National Horseracing Authority’s drug testing laboratory. Eventually, I landed up at a company which made natural medicines for humans. I did the stability testing, R&D and dealt with customer complaints. I learnt an enormous amount in this position. Most notably, I learnt that, like all things, natural medicines are subject to fashion. It seemed certain nutraceuticals really did work, while others were no more than overhyped food ingredients. At the same company, a friend and I saw a gap in the market for horse supplements (being horse people) and started The Herbal Horse in 2000. In 2006, we decided to part ways and split the company. 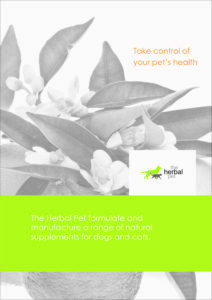 This allowed me to focus on a range of supplements for pets and The Herbal Pet range was born. and of course, most recently we were one of 21 winners of the Pick n Pay Boost Your Biz competition, which is helping to put small businesses like ours onto the shelves of Pick n Pay. My partner, Garth Shoebridge joined the company a few years back and started to advise on sensible things like Business Strategy and Planning. He also runs the digital side of our company like the websites and the many software applications we use to make our business efficient. I’m helped in the business by Deliwe Mashoabate, Thabelo Malindi, Ndozi Mdhluli and Tilly Seroto. And last but not least my daughter, Savannah. Beryl Shuttleworth (BSc Hons Biochem, BSc Biochem/Zoology) Horserider. Dog and cat lover. Obsessive book reader. Fanatically busy mom. Cannabis – a dose of realism? We formulate and make natural supplements for pets and horses. Take control of their health with our range of innovative supplements.